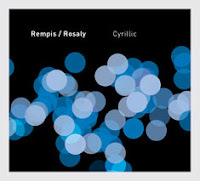 Cyrllic - Rempis/Rosaly (482 Music) - Saxophonist Dave Rempis, a Massachusetts native who moved to Chicago to attend Northwestern University and stayed to become an integral part of the creative jazz scene. Best known for his association with the Vandermark 5, Rempis plays in a number of different ensembles plus is very involved as a music presenter. Drummer Frank Rosaly has lived in Chicago since 2001 and has worked with vibraphonist Jason Adasiewicz, saxophonist Aram Shelton, cellist Fred Lonborg-Holm, and the Rempis Percussion Quartet as well as leading his own groups. The duo has played gigs together since 2004 but "Cyrillic" is their debut recording. As one might expect from these 2 adventurous players, the music is fiery, explosive, declamatory, sometimes whisper-soft, with smart shifts in dynamics and rhythmic intensity. Rempis work well in the duo setting; he gives as good as he gets, spilling out lines that run from melodic to percussive, riding atop Rosaly's propulsive percussion, often pushing him to play harder and faster. The music is often playful, as if the musicians were sparring, feinting, jabbing, dancing around and with each other. "How To Cross When Bridges Are Out" is the longest track (nearly 16 minutes) and one has to admire how the duo hits the music so hard - there is a great rhythmic intensity that not only grounds the music but also allows Rempis' sometimes sweet, other times tart alto to move in and out. He brings out his baritone sax for "In Plain Sight", a hard-bop piece that rarely lets up. Rosaly's touch moves from feather-light to hard-edged but never losing the propulsive element. "The baritone also makes an appearance on "Thief of Sleep", a ballad that feels contemplative in the midst of the more incendiary tracks. At times, "Cyrllic" reminds me of the great Max Roach & Anthony Braxton duo recordings from the late 1970s. One hears it in the percussive drive, in the sonic explorations, in the intelligent give-and-take. This is music that works very well in the concert and makes for an engaging and challenging recording. For more information, go to www.482music.com, to www.daverempis.com or www.frankrosaly.com. Portraits - Matt Slocum (Chandra Records) - This is drummer/composer Slocum's debut as a leader and is a rewarding adventure for the listener. A Wisconsin native, he studied at USC with John Clayton, Alan Pasqua, and Peter Erskine (who supplied the liner notes), has toured with vocalist Sara Gazarek and recently made the move to New York City. The basic band for the recording is the fine young pianist Gerald Clayton (all but 2 tracks) and bassist Massimo Biolcati. Tenor saxophonist Walter Smith III appears on the piano-less cuts, tenor saxophonist Dayna Stephens appears on 2 other tracks and alto saxophonist Jaleel Shaw joins with Stephens and the band on 1 song. First thing one hears is how crisp the music sounds - you can hear the nuances of Slocum's active stick work and the full tones of Biolcati's bass lines. The music on the opening 2 cuts has a gentle intensity, with "Homage" displaying Smith's rousing tenor work and "Cambria" Clayton's lyrical side. The rhythm section is totally engaged, not just playing the beat but reacting to the soloists' dynamic shifts. Smith also appears on the disk's one non-original, a sweet, bluesy, take of Ellington/Strayhorn's "Daydream." He shows the influence of Joe Lovano on this track, with a solo that never lose the intention of the song. Other highlights include the high-flying "Shadows", a piano trio piece with a melody line that sounds by Wayne Shorter and Herbie Hancock. Clayton builds his solo intelligently, rising to a smashing climax that leads to a heated drum solo. The 2 saxophonists are featured on "Seven Stars", weaving phrases around each other while the rhythm section pushes and prods them on. The middle of the tune belongs to Clayton for another melodic and dynamically engaging solo. The prettiest piece is "For Alin", a ballad with a lovely melody line, good bass work and excellent work from the leader on the cymbals. The CD closes with "Avenida del Paraiso"(perhaps named for the street in Carlsbad, California, or Caracas, Venezuela), another intense yet not overpowering trio piece. 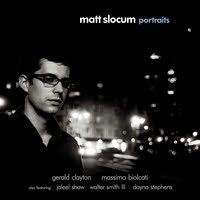 Matt Slocum's debut is filled with good melodies, smart arrangements, strong solos, and great promise. The music is creative and somewhat mainstream (no "outside" music or exotic sounds) yet is consistently entertaining. To find out more, go to http://mattslocumjazz.com or http://chandrarecords.com. 2 concerts to be aware of this weekend and both are in Hartford. Saturday night January 30 at 8 pm., The Studio at Billings Forge (565 Broad Street, across from the Firebox Restaurant) presents the duo of Noah Preminger (saxophones, pictured left) and Ben Monder (guitar) in a Benefit Concert for the Covenant Preparatory School and Grace Academy (a girls' school set to open in September of this year.) Preminger, a native of Canton, CT, is an excellent young musician whose debut CD, "Dry Bridge Road" (NOWT Records), was issued in 2008 to great critical acclaim. Monder is a first-class, first-call, guitarist who works with many groups including the Maria Schneider Orchestra, Guillermo Klein y Los Gauchos, vocalist Kendra Shank, Paul Motian, and many others. For more information about the concert and the other events surrounding the benefit, call 860-519-1997. On Sunday January 31, the Hartford Public Library's "Baby Grand Jazz Series" presents David Bryant in concert at 3 p.m. in The Atrium. Bryant, a native of Brooklyn, NY, has worked with Hartt School of Music teacher and trombonist Steve Davis, saxophonist Marcus Strickland, vocalist Jen Shyu and many others. The concert is free and open to the public. The Library is located at 500 Main Street and the contact number is 860-695-6295.